Hey everyone! Travis here with...yes...a giveaway!!!!!! Actually, we will be doing a couple of giveaways, so make sure you are paying attention to the details. We are giving away family four packs of tickets to Big Cat Rescue, which is one of the cool Tampa Florida attractions around! We will be doing the giveaways on the Visit Tampa Bay Facebook fan page, so make sure you log on now and become a fan...www.Facebook.com/VisitTampaBay. At 10 am this Wednesday and Thursday (Dec. 9 & 10), we will post a trivia question. The first 10 fans who reply with the correct answer will have a chance to win the tickets. 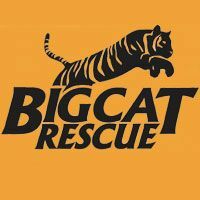 Here&apos;s some info about Big Cat Rescue: It&apos;s a non profit educational sanctuary devoted to rescuing and providing a permanent home for exotic cats who have been abused, abandoned, bred to be pets, retired from performing acts, or saved from being slaughtered for fur coats, and to educating the public about these animals and the issues facing them in captivity and in the wild. If you want more info about Big Cat Rescue, just log on to www.bigcatrescue.org. So, we&apos;ll see you on Wednesday and Thursday at 10 on the Visit Tampa Bay Facebook page (www.Facebook.com/VisitTampaBay) for the contest! Until then, keep checking back for more great things to do in Tampa Bay and other Tampa Bay area events.